Space Shuttle Challenger (OV-099) was the second space shuttle used by NASA to fly into outer space. The shuttle broke up 73 seconds after take-off from Cape Canaveral on 28 January 1986. 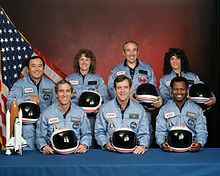 All seven astronauts who were on it at the time were killed. The crash happened because a rubber tube called an o-ring did not expand to fill a gap in one of the booster rockets, due to cold weather. The Challenger was named after a Royal Navy ship that explored the Pacific and Atlantic Oceans from 1872 to 1876. Challenger was also the name of the Apollo 17 Lunar Excursion Module. 5 06.April.1984 STS-41-C 39-A Edwards Air Force Base First on-orbit spacecraft repair. 6 05.October.84 STS-41-G 39-A Kennedy Space Center Earth Radiation Budget Satellite, Office of Space and Terrestrial Applications-3. 10 28 January 1986 STS-51-L 39-B Did not land(Planned to land at Kennedy Space Center) TDRS-2; SPARTAN-203 Satellites. 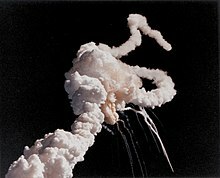 Shuttle destroyed after liftoff & all seven astronauts on board died. ↑ "Space Today Online - Space Shuttle Stories". spacetoday.org. Retrieved 19 November 2010. This page was last changed on 13 March 2019, at 09:01.